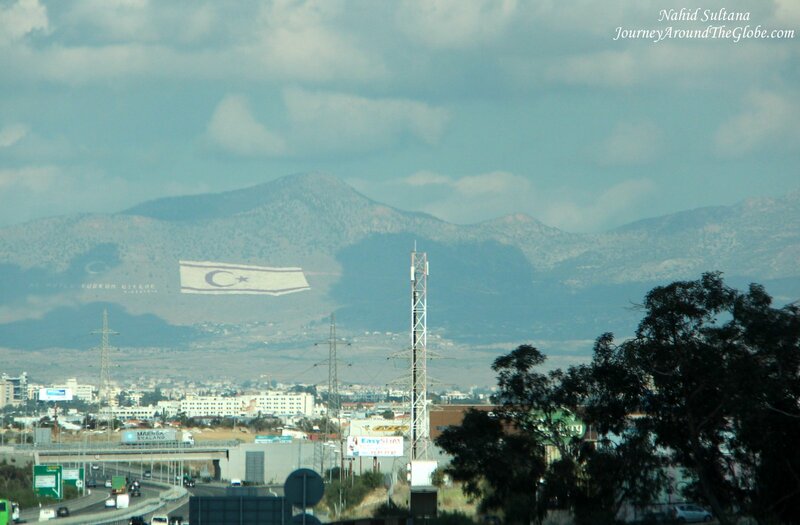 NORTHERN CYPRUS (or TURKISH REPUBLIC of NORTHERN CYPRUS): Sad but true that Cyprus is the only divided country in Europe and its northern part has been occupied by Turkish forces since 1974. Since then Turkey has been occupying 1/3 of this island and only Turkey recognizes this land officially calling it “Turkish Republic of Northern Cyprus”. Other countries and UN recognize this island as Republic of Cyprus and calls the Turkish side “Northern Cyprus or occupied Cyprus”. With proper documentation anyone can cross the border to go the northern part of Cyprus. We spent a day in Northern Cyprus during our visit to Cyprus and got a little taste of Turkey in the northern part. Nicosia is the capital of Republic of Cyprus. 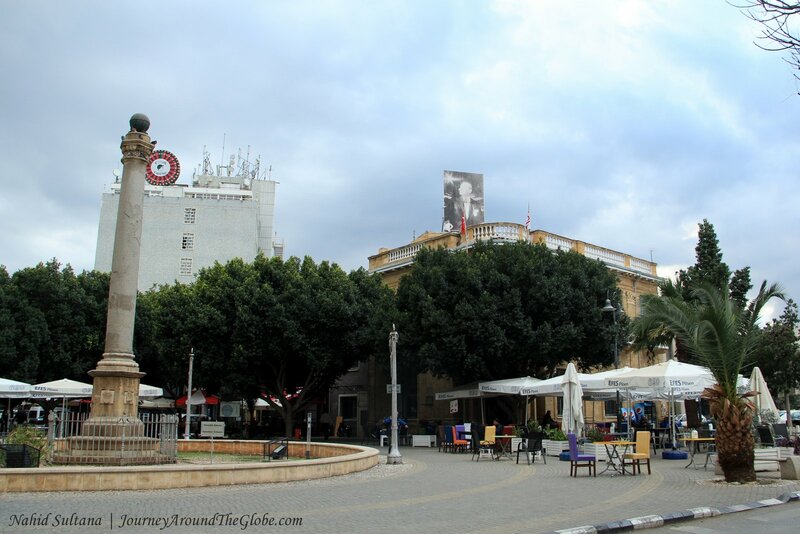 Most of the tourists usually cross the border to go to the northern part on foot via Ledra Street for a day-trip and come back to the southern part. We parked our car in South Nicosia and walked to the border to go to the Turkish side. 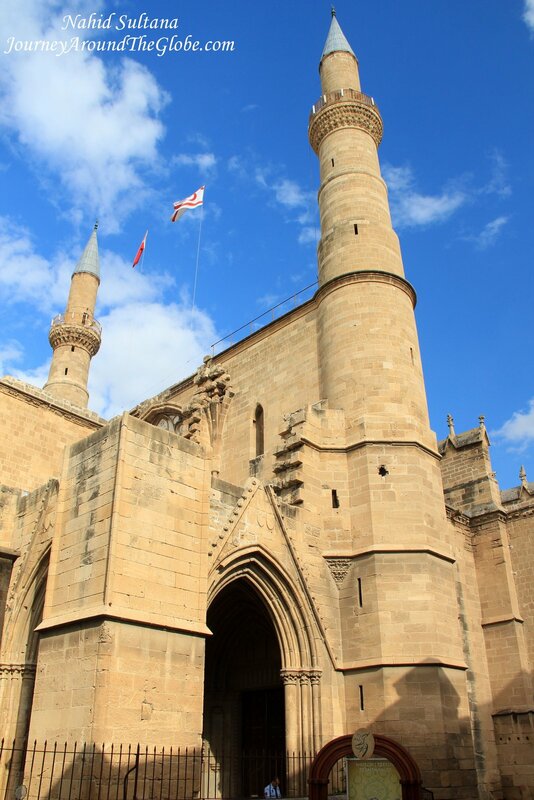 Northern Nicosia contains about half of the old city and this old walled city boasts of many attractions and heritage for its tourists. TIME of TRAVEL: We flew to Cyprus in December 2013 only for few days out of which we spent a day in the northern side. Weather is actually very pleasant in Cyprus in December, I guess being by the Mediterranean helps. It was a bit colder once in a while, especially after dark. OUR HOTEL: Please see my page on Republic of Cyprus on the right-side bar to see which accommodation we used in Cyprus. 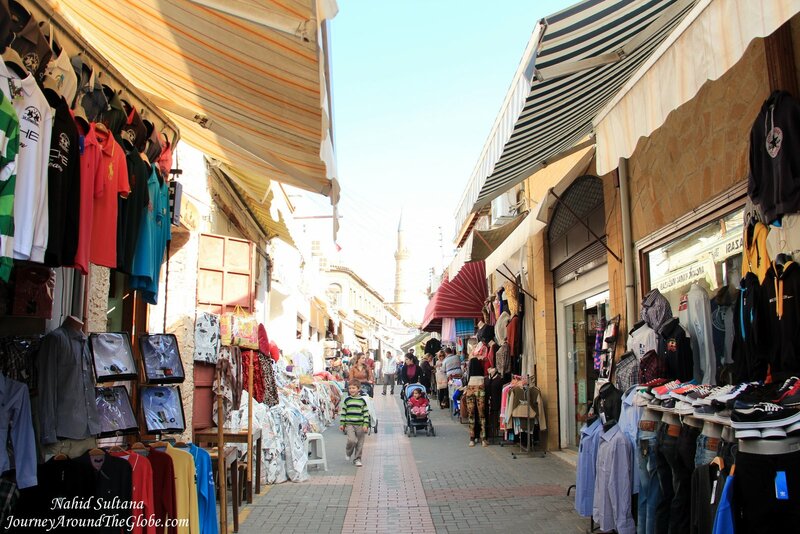 EATING and SHOPPING: When you are in Northern Cyprus/the Turkish territory, you can get a little bit everything that you would normally get in Turkey. Turkish delights, apple tea, potteries, wall décor, and small trinkets can be found in the old town of Northern Nicosia. 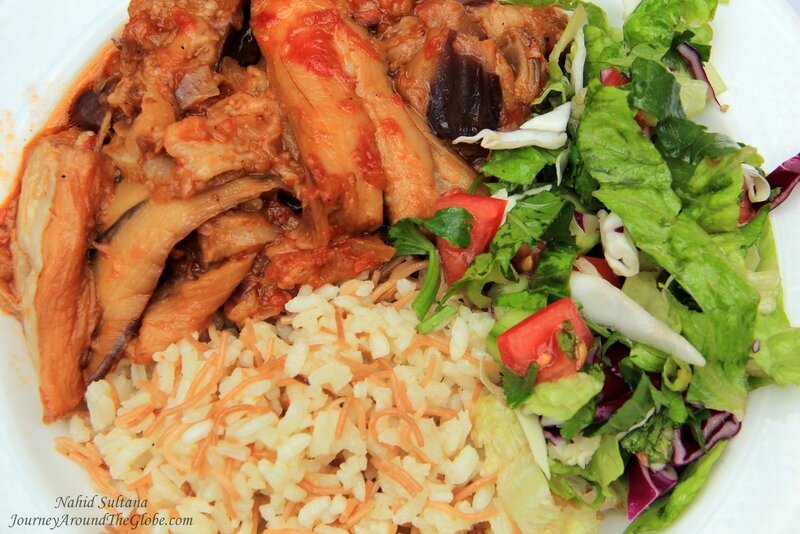 Dishes here are not very typical Turkish, nor Cypriot; they are more like blend of both. We had lunch in Muze Dostlari near Selimiye Mosque. They had very limited menu but had some good traditional food. I wanted to try moussaka but when I ordered it here, it didn’t look like the traditional Greek moussaka. I had moussaka which was more like a casserole but here the dish came with some cooked aubergine with Turkish style rice and salad. It was very tasty but just looked different. My girls had rice with Turkish style meat-balls, very well too. My lunch in Northern Cyprus – moussaka, Turkish style??? 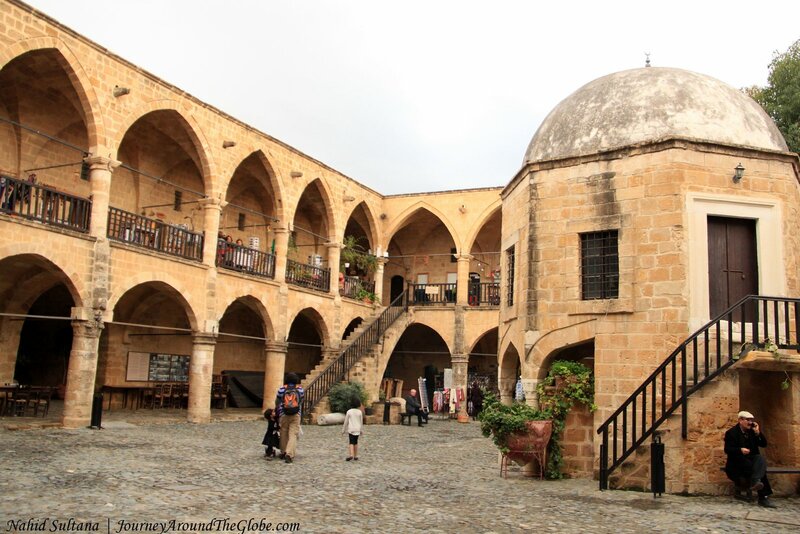 PLACES WE’VE VISITED: After crossing the border to Northern Cyprus, we spent few hours here, mainly staying in the old town and visiting sites within the wall. You can cover the old part on foot very leisurely, it’s small and very well marked. 1) SELIMIYE MOSQUE: As locals call it Selimiye Camii, was once known as St. Sophia Cathedral. This is a top attraction of Northern Nicosia and a must-visit landmark. This fortress-looking mosque was built from 1208 – 1326. It was converted to a mosque in 1570 during Ottoman’ time and two minarets were added then. This is still an active mosque, therefore no visitors are allowed during prayer time. It’s a beautiful masjid/mosque inside and outside, especially loved the courtyard. 2) ATATURK SQUARE: This is the main square and supposed to be heart of the city. Don’t be disappointed by its simple and dull look. A thin medieval Venetian columns stands in the middle of the square surrounded by pedestrian walking zones. Historic judicial building is in one side of the square. 3) KYRENIA GATE: This is one of the original gates of the city from the Venetian time in 1567. 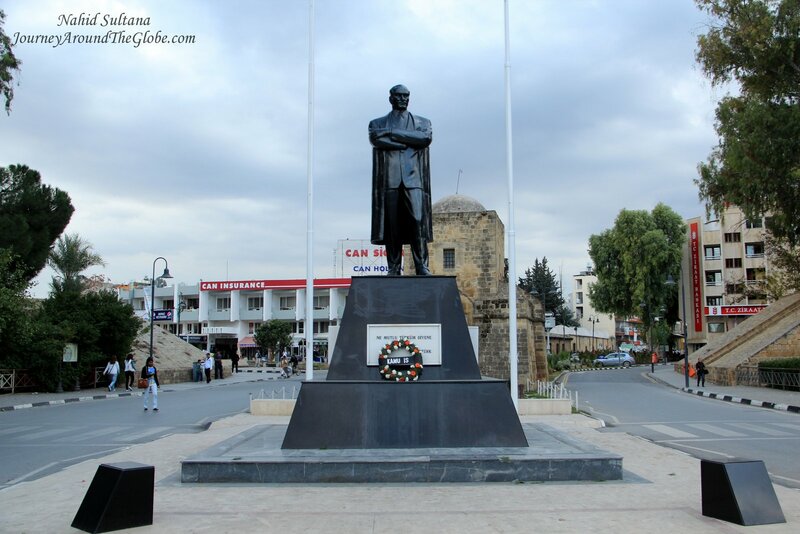 A statue of Kamal Ataturk stands facing the big street in front of it. 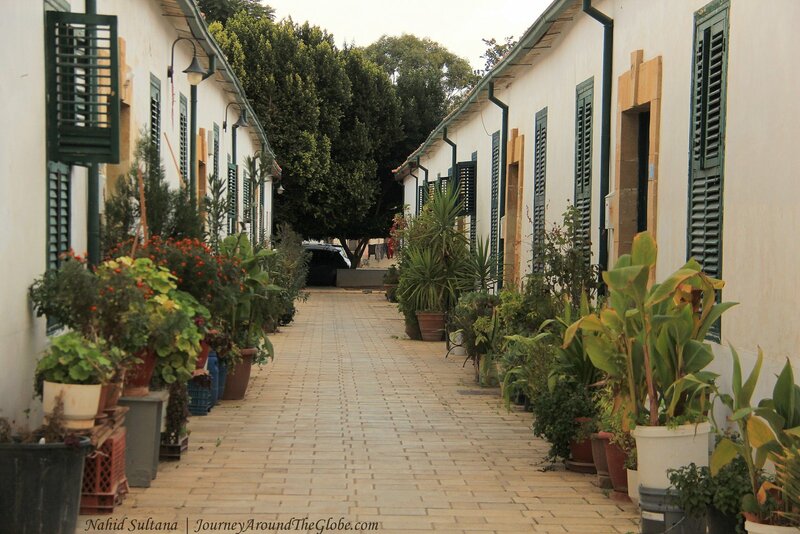 4) SAMANBAHCE HOUSES: This is a must-visit place in Northern Nicosia. You can see traditional Turkish Cypriot architecture and houses in this small neighborhood. The houses and streets are very well persevered and were decorated with fresh flowers and plants. Originally, Samanbahce is thought to have been one of several gardens used by the residents of the Walled City. As the demand for housing grew, Samanbahce was developed into a social housing complex. Approximately by 1894 this was partially built and functioning as social housing. The whole construction was done in phases and was completed in 1955. This was the first known social housing to have been constructed in Cyprus and consists of 72 separate units along 5 rows parallel to Kyrenia Avenue. Samanbahce Area covers about 2000 square meters and is located on the northern edges of the walled city of Nicosia, very close to Kyrenia Avenue, and to the bastion of Quirini. It’s a unique neighborhood with much defined geometric narrow roads and units of one story mud-brick construction with red-tiled roof. A large fountain is located in the core of the estate while a large open space (parking and playground for children) can be found in the northern corner. 5) BUYUK HAMAM or GRAND TURKISH BATH: This building was once St. George of Latin’s Church. Built about 500 years ago, it is still an active place for relaxation. The hamam is open every day from 9am, for both men and women but only for customers, not for tourism purposes. 6) BUYUK HAN (THE GREAT INN): Built in 1572, this is one of the most important architectural works of the Turkish period in Cyprus. The “Han”, which was built to provide accommodation for travelers from Anatolia, Turkey and other parts of Cyprus. Presently it’s a nice place to do some souvenirs hunting and have some Turkish drinks or light snacks and enjoy the enclosing architecture of it. We sat down for some Turkish apple tea in the late afternoon after getting some small gift items from the downstairs shops. The Buyuk Han (Big Inn) is located in the traditional market center, within the city walls of Nicosia. The stone-paved square has two-story Buyuk Han that consists of 68 rooms which open to the vaulted galleried surrounding a square planned inner courtyard, and few shops which open to the outside of the Han. An Ottoman Masjid stands on marble piers, with a fountain (used for ritual ablutions) beneath, in the center of the courtyard. It has two entrances: east and west.